A sudden overwhelming fear or anxiety that emerges right before one leaves Thailand due to the belief that such delicious dishes might not be had again for a very long time. This results in behavior that includes irrational purchasing of any and all food that passes by or that the sufferer comes across. When such attacks of Noodle Panic arise, it is best for the sufferer to be supervised by a loved one and for their wallet to be looked after. Symptoms include: an inability to keep conversation, darting eyes, perspiration, shortness of breath, a slight dizzy feeling, trembling, and the desire to spend an unlimited amount of money on food. Origin: The first case was diagnosed on a night train on February 12, 2012 by David Domagalski. While attempting to play cards, his usually sane girlfriend, was overcome with anxiety due to the fact that she was unsure when she would ever eat such delicious Thai food in Thailand again. This resulted in a very distracted card game as countless vendors walked the train car aisle selling noodles, snacks, and beverages. Despite her lack of hunger due to an impulsive Pad Siew purchase earlier that day, she repeatedly asked David if she should buy things, to which he smartly replied no. If the person suffering from a Noodle Panic attack is encouraged, an entire budget can be blown and more food than they can eat will be bought. Dave and I spent six hours walking around the Royal Flora Expo in Chiang Mai. In the evening, while Dave was getting artsy with his DSLR, I played around with the burst mode on my camera. What I ended up with was a really neat collage and a very short time lapse. Please click on the picture to experience the full-size image. If you enjoyed this post, please consider following me on Facebook and/or Twitter. I love uncovering activities in Thailand where there are very few farang (foreigners) making loud ridiculous comments while toting large Chang beers that match their Chang tank tops. The International Horticultural Exposition: Royal Flora Ratchaphruek was exactly one of those great finds that the masses (foreign tourists that is) hadn’t heard about. It was foreigner friendly with plenty of information in English, but the majority of the people wandering around were Thai. Just my scene. I was super proud of Thailand while walking around the huge horticulture theme park. The first road from the entrance, and the suggested path, takes you through the gardens and exhibits of a wide variety of government related departments including the Department of Livestock Development, Rice Department, Ministry of National Resources and Environment, Land Development Department, etc. I thought this was genius because it led people to the most educational sections first; sections they may have chosen to skip otherwise. I started this post while I was living on Koh Tao last year. Today I dug it out of my computer and finished it. I left the intro alone even though I no longer live on Koh Tao. I don’t like spiders. I know they are the good guys for the most part, but they are creepy. In my defense, I do have a somewhat legitimate reason to be wary of them, my house growing up was filled with spiders that used to bite me in my sleep. I guess it’s not just the bed bugs you’ve got to worry about. So this morning, when I was tying the bikini string around my neck and noticed a spider crawling on my top, I naturally freaked. I let out a pitiful squeal, hit my chest and sent the spider flying to the ground. I used to be a spider killer, but Dave has taught me otherwise, so in his honor I gently swept it outside to live with its spider friends in the outside world on Koh Tao in Thailand, where it belongs. I’ve spent three Thanksgiving holidays abroad now, which makes me a little sad because Thanksgiving at my house is the best. Yeah, yeah, your mom makes the best pie or turkey, whatever. My mom seriously makes the most wonderful food. She makes everything from scratch, and on top of making the turkey, two pumpkin pies, a pecan pie, a crimson pie, cranberry sauce, salad, green beans, gravy, and stuffing, she also makes vegetarian friendly stuffing and a tofurkey for our non-meat eating family members. My mom rocks and so do our gourmet Thanksgivings, but as we all know though, Thanksgiving isn’t all about the food. It’s also about the family and friends gathering around a huge table and being thankful for all of the love in your life. If you have to be abroad for Thanksgiving, you have to work a little bit harder to find both the food and the company to share the evening with. Having at least one of these two things while abroad for Thanksgiving is lucky. My first Thanksgiving abroad was five years ago while I was on Semester at Sea. We were in Spain on Thanksgiving Day, and my friends and I ended up spending the entire Thanksgiving evening in an Irish pub. I think I ate half a bag of chips that night. Not a successful turkey day because there was not a bit of turkey involved or much food for that matter, but it was filled with lots of good friends and love. Unfortunately, my second Thanksgiving out of the country wasn’t nearly as successful as my first turkey-less turkey day. I was living in Khon Kaen, Thailand at the time, and my American buddy invited me to a Thanksgiving buffet at the Sofitel, the nicest hotel in the city. I was very excited to actually get to celebrate one of my favorite holidays with other turkey lovers! Thanksgiving night I called to confirm what time we would meet and I was informed that we had missed the dinner. 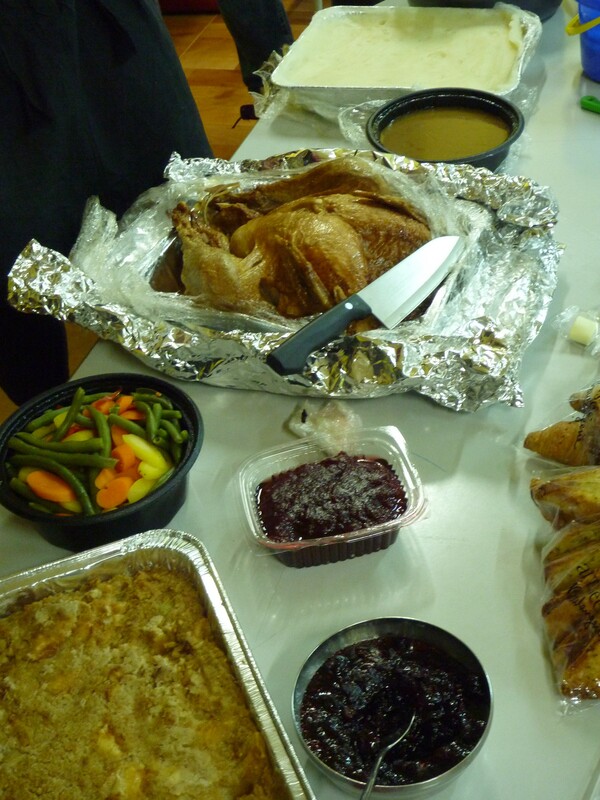 They had held the Thanksgiving dinner for the foreigners the Saturday before and we had missed it! I was heartbroken. Who celebrates Thanksgiving on a Saturday?!? No turkey, no pie, and no one to spend Thanksgiving with. I ended up eating fried rice alone at one of the restaurants I frequented. It was not a good Thanksgiving. This year I knew that I would be missing Thanksgiving again, so I made sure we celebrated before I left the home. It was a much smaller Thanksgiving than usual because not all of the usual attendees could make it in October, but it was perfect nonetheless. I figured that if I ate a Thanksgiving dinner before I departed, then I couldn’t complain about not having a fabulous holiday with all the fixings in November, little did I know that I would get to have a real Thanksgiving dinner here in Seoul too. I really lucked out getting two Thanksgivings in one year, and the best part was that I didn’t have to celebrate in Korea alone; all of the other teachers at the school I’m working at, even the Canadians and British, partook in the festivities. We ordered a Thanksgiving dinner to go from Dragon Hill Lodge in Itaewon, which is close to the US army base (hence the availability of a Thanksgivingtake-away meal). For around one hundred bucks, you get a meal that serves ten to twelve people, as advertised. The package includes a turkey, stuffing, cranberry sauce, vegetables, mashed potatoes, gravy, and a pumpkin pie. Altogether for fifteen of us, including the cab fare to pick up the meal, it cost around eight dollars per person. Not bad for a Thanksgiving feast. Concerned that there wouldn’t be enough food, we each brought side dishes. I made my mother’s delectable cranberry sauce, so even though I was away for Thanksgiving I still had my mom there in a way. Others brought mashed potatoes, two extra pumpkin pies purchased from the always reliable Costco, a broccoli pasta dish, scones, rolls, sweet garlic bread, and spring rolls. We had our feast in the gym of the school, each of us seated in the tiny kindergarten chairs making our glasses of wine and beer seem slightly sinful. After the meal was over the girls talked over the leftovers while the boys played some form of football/basketball, reverting to the traditional Thanksgiving roles. We divvied up the leftovers, put the wine and beer bottles in the recycling, and moved the kindergarten tables and chairs back to the classrooms where they belonged. Tomorrow the kids will be none-the-wiser about what their teachers were up to the night before. Although nothing comes close to mom’s Thanksgiving dinner, this year’s was as close as a Thanksgiving abroad can get. This post was originally written for diwyy.com. The search for a job teaching English abroad can be done in several ways. It mostly depends on the country where you are interested in teaching. Developed countries will have more requirements for being hired and will usually have more visa requirements as well. Whereas developing countries typically do not have as much red tape and make the search a little bit easier. The Internet is going to be your key to finding a job abroad. If you Google the phrase: “teach English abroad” you will get six million results back, so I suggest making your internet search a little more specific. If you can determine a few cities you think you would enjoy being stationed in, then it will make your search a bit easier. At the same time though, you need to be flexible. If you have your heart set on one city, it might take you a while to find a job, or you could be disappointed when you only find listings in other cities. If you are interested in teaching in a developing country, I usually suggest packing your bags, buying a plane ticket and just showing up in your country of interest. This sounds incredibly scary and risky, but is worth it for a few reasons. The first time I left the country to work abroad, it sounded like it would be a great fit, but I quickly found out upon arrival that the city I was going to be living in was not ideal for me. Throughout my stay in Thailand, I was constantly offered teaching positions everywhere I went. I realized that I could have just wandered the country until I found a suitable location, and then accepted one of the many jobs offered to me. If this is an option you might actually consider, then you need to be a very proactive person. Sometimes being offered a job is as easy as mentioning that you are an English teacher to the right person, but if you are avidly looking for a job, you might need to be a little more aggressive than that. Tell everyone you meet abroad that you are an English teacher looking to settle down in that area. Most people you will meet know at least one other English teacher or school, and this can lead to important connections. Schools can’t hire you if they don’t know you are out there looking for a job. Make sure you let people know you are interested. Networking is your best friend in this type of search, not the Internet. Things can be much more complicated if you are looking to teach in a more developed country. For example, South Korea requires that you send them your diploma, a background check, and transcripts from your university. Not only do they need all of these items, but they also need you to be in your home country during the application process. So it would be a poor idea to show up in South Korea and hope to get a job. If you are leaning towards teaching in a developed country or don’t want to show up in a developing country looking for work, then your next question is “How do I find a job on the internet?” Before you start googling, let me warn you that many of the ‘jobs’ you will find listed are not in fact jobs. Many times they will ask you to pay them to come teach English. Volunteering is wonderful and I am sure that there are pay-to-volunteer programs available that put a lot of the money you pay towards helping the organization you work with, but unfortunately there are many that don’t. Sometimes the organizations that will set you up with a teaching position if you pay a couple thousand bucks are just scamming you. For one of my previous jobs I worked with volunteers who came through a rather large name in the pay to volunteer business, and I can say without a doubt that almost all of the money went directly into their pockets and did not reach our organization. So if you choose the pay-to-volunteer route, make sure your money is going where you want it to. Remember what I said in my previous post as well, TEFL and TESOL certification is not completely necessary to teach abroad. Before you spend the money on it, make sure you absolutely need it. Sifting through the results that your search engine will turn up is definitely a process. Idealist.org is a great website for the global job search. This website allows you to search by country, language, categories, job type, etc. If you are interested in teaching English in South Korea I recommend going to Dave’s ESL Cafe and checking out the listings there. I wish I had a list of websites for prospective teachers for every country, but I don’t. If you know of a great website for teaching abroad in any country, please comment below. Let’s compile a list of helpful websites for prospective English teachers! This post was written for www.diwyy.com. My favorite way to travel is to stay in one place for an extended period of time so I can fully immerse myself in the country I am visiting. If you don’t have a large sum of money saved up, then the only way to really travel this way is by getting a job in the country you are interested in. Lucky for us native English speakers, English teachers are in demand in many exciting parts of the world. There are several things you must have before you are ready to teach abroad. Most organizations and people looking for English teachers want a person with a university diploma. Most of the time it doesn’t matter what you major was, they just want to know that you went to school and got a degree. Your chances of getting a competitive job are usually greater if you received a degree in education or English, but it’s typically not a requirement. The most debated question is whether or not you need TESOL (Teachers of English to Speakers of Other Languages) certification to be hired. I really hate wasting money and so I’ve debated whether or not I need to invest in this certification over and over again. The first time I was looking for teaching jobs, I was bombarded by advertisements attempting to persuade me to invest in their certification program. I quickly found out that I could get hired just by being a native speaker and by having a degree from an American university. While looking for a job in South Korea this summer, I was told by a recruiter that the job market is very competitive right now and that my chances were significantly better if I completed an online certification course. The online courses run about $200 or more and the classroom courses can run a lot more than that. One of my travel buddies told me that the online courses are pretty much worthless, and for the most part, employers know that. I chose not to take the course and I still got some really great job offers. So in my opinion, the certification programs are fine if you have time and money to spend, but if you don’t, you will still be able to find a good job without it. When applying for English teaching jobs, it is important to put every single teaching experience on your resume. I used to teach figure skating to children and adults, and although that has nothing to do with teaching English, it still shows that I am capable of explaining concepts to a class and keeping a group of children under control. Think of every single teaching or tutoring experience you’ve had and share them with your prospective school. Since you’ve decided you are ready for a job teaching abroad you most likely have a region already in mind. If you don’t, start making a list of your top picks for countries or cities you’d like to work in. It is perfectly okay to choose a region based on wanting to travel around it. When I went to Thailand to teach English, I chose it because I knew I wanted to be in Southeast Asia and it was central to all of the other countries I wanted to visit. It wasn’t until I got there that I realized that I wanted to learn about Thai language and Thai cooking. The next part of the search is to determine whether you are a city person or whether you could handle living in the countryside. This might be a tough question for some of you. I used to think that I could be happy anywhere. Turns out that that’s not true for me. I now know that I need a good group of fellow foreigner friends around to keep my spirits up. At the same time though, I don’t like to live in areas that are flooded with foreigners because these areas are very touristy and the native culture tends to get lost. So I like to live in large cities because you can find almost anything you need there, whether it be other foreigners or native culture. Large cities also tend to be good jumping off points for other adventures. I know people who have been perfectly content living and teaching in the boonies, I just have figured out over time that I am not one of them. Once you’ve figured out all of those important details, you then need to start looking for employment. This requires a lot of searching and patience. I will talk about the process of looking for a teaching job in my next post. I’ve noticed that foreigners in Thailand get stuck in a rut when it comes to food. I can’t help but roll my eyes every time someone orders another Pad Thai. I’ve eaten with people who ask for Pad Thai for lunch, dinner, and then lunch again the next day. I find this sad and absurd because Pad Thai is usually cooked poorly where tourists eat. No one should eat the same thing over and over again while traveling because there are so many other yummy dishes out there waiting to be tried. Part of the problem is that people just don’t know what to order, so here’s a few dishes you can eat, other than Pad Thai, while in Thailand or at a Thai restaurant at home. Som Tum is one of the most popular dishes in Thailand. I have yet to meet a Thai person who isn’t obsessed with this dish. Som Tum is made with shredded green papaya, garlic, chili peppers, fish sauce, sugar, dried shrimp, tomatoes, and long beans. All of these ingredients are put in a mortar and pounded a few times with a pestle to release the juices, and then served with a side of sticky rice. I prefer Som Tum Thai which is sweet, has peanuts, and isn’t very fishy. If you don’t mind a fishy flavor you should give the Som Tum Blah a try. This version is very popular and has tiny crabs and more fish sauce in it. Som Tum is sold in restaurants and by street vendors, so you can pretty much pick some up everywhere. This dish is an absolute must while in Thailand. If you are afraid of spicy foods, just remember to ask for only one or two chili peppers. This is the most famous Thai soup. If you get into a conversation about Thai food with a Thai person, they are inevitably going to ask if you’ve tried Tom Yum Goong. So try it! Tom Yum Goong is a hot, spicy, and sour orange soup. The base is a stock flavored with lemongrass, kaffir limes, fish sauce, and chili peppers. Inside the soup you will find prawns (goong) and mushrooms. You don’t have to love this soup, but since it is such a staple in Thai cuisine, you at least have to taste it once. This is my alternative to Pad Thai. It is my favorite noodle dish in Thailand. Pad Siew is made with flat wide noodles, a soy based sauce, and broccoli. I think chicken goes best with this dish, but pork or tofu are usually options as well. I always introduce new comers to Thai cuisine to Pad Siew, and have yet to get a bad review of it. If you are craving noodles, try this instead of Pad Thai. Please!! This is a spicy dish so beware. Pad Gapow is made with chicken, basil, chili peppers, sugar, garlic, and fish sauce. It is typically served with rice and is one of the only spicy dishes I consistently order. I recommend getting a beer with this one; it tends to thwart the burning sensation a bit. I never knew I could love a vegetable dish so much until I tasted Pad Pak Boong. This dish translates directly to Fried Vegetable Morning Glory Fire Red. You are guessing correctly if you think it might be a bit spicy. Pad Pak Boong doesn’t always have to have the fai dang (red fire) in it, and it probably won’t if you are a foreigner ordering it. Thai people know that our tolerance for spicy peppers is far below theirs, but let your server know if you want it spicy or not, just in case. Morning glory is also known as water spinach for us. It isn’t wide spread here in the United States, but is wildly popular in Asia. I miss it greatly when I return home, so while I’m in Thailand I order this whenever I can. The morning glory in this dish is stir fried in a brown soy based sauce, which I recommend eating with some sticky rice to soak up the delicious sauce. There you have it: five alternatives to eating Pad Thai! After trying these dishes you probably won’t want to go back to eating Pad Thai. Happy Travels! My first five months in Thailand were spent working with a small organization. I didn’t leave home with anyone else, but I felt like I had security going to Thailand with a job already lined up. It was the perfect way to travel to another country without really having to do it alone or with my own money. Over my Christmas break, I traveled down to Koh Samui to visit a friend and on my bus journey I met a girl who was backpacking alone for a year. I was in complete awe of her. I asked her question after question trying to figure out how this girl was able to do it alone. Aren’t you scared? Do you get lonely? What does your family think? Is your mother okay with this? Now that I think back on that conversation, it seems rather silly of me to be so in awe of her since I was technically traveling alone already, I just hadn’t realized it yet. A few months after talking to this lone backpacker, I would make the decision to backpack through Asia alone and it felt like such a huge deal. Making the decision to travel alone was probably more difficult than the actual act of backpacking alone. I had originally intended to travel with a friend after my contract was finished because the idea of traveling solo as a very petite girl didn’t sound like a smart idea. But while we were planning where to go and what to see I realized that our travel styles were completely different. We were both agreeing to do things we didn’t want to do. My travel style was a little more spontaneous and less about seeing the sights you are supposed to see. I am really uncomfortable in crowds with loads of other tourists, so I tend to stay away from the popular destinations. I like to show up somewhere, eat with the locals, and rely on the small tips I pick up from other backpackers along the way. Not only is this style of travel cheaper, but it also lets me peer into how the country really works. Compromising on something so personal and wonderful felt silly. So after a long hard think, I decided I had to just do it alone. If I wanted to travel my way, then there was no other way than to do it by myself. Once I made the decision to travel alone, I got the same questions I had asked the girl I met on the bus. It was funny to find myself responding to the same inquiries I had had just a few months earlier. I told everyone not to worry, but was still secretly not entirely convinced that I was capable of pulling it off. I thought I could probably do it since I’d survived five months in Thailand already, but then again backpacking and living in an apartment abroad are two different animals. Choosing to backpack all by my lonesome was not an easy choice, but it was one of the best things I’ve ever done for myself. It wasn’t dangerous or scary in the least bit. Now I tell everyone I know that they should travel alone at least once in their lifetime. Most travelers are not just in search of beautiful places, good food, and interesting cultures; they are also looking to learn. They want to educate themselves about the rest of the world and at the same time they are looking to learn about themselves. There is no better way to get to know yourself than putting on a backpack and sending yourself out into the world unaccompanied. When you are on your own, you have no one to listen to but your own thoughts. You see sides of yourself that are usually hiding below the surface, sides that you love and sides that you want to work on. Most people don’t want to take the leap and travel alone because there is this nasty rumor going around that it’s dangerous. If you make stupid decisions, traveling can be dangerous whether you are alone or with a group of friends. Unless you have a buddy to watch your back, getting black out drunk while backpacking is just asking for trouble. A lot of problems arise from being unaware of what’s going on and there is no better way to dull your senses than a few too many drinks. Staying alert is a good way to stay safe and in possession of those important things like your passport and debit cards. Plus, I like to think that getting hammered is something we can easily do at home, so why travel to another country to do it? If you are truly interested in traveling, then you won’t want to be hungover the next day. A killer hangover is a great way to miss out on the happenings in the city where you’re staying. One of the other most common worries regarding solo travel is that you will get lonely. This is an easily avoidable problem because you will inevitably meet other travelers along the way and will make friends if you want to. In fact, I have found that when you travel in a group you usually don’t meet as many new people as you do when you travel alone. Being alone makes you more approachable and people are more inclined to talk to you or invite you to join them. I do have to admit one little downside to being a girl and traveling alone…you are going to have to fend off the men. I never felt sexually threatened, but I became very tired of being asked out and I even became wary of men asking for my hand in marriage! My guide in Tibet was convinced that I was his future wife and it made things a little awkward for me when he wouldn’t accept my refusals. I usually don’t sign up for guided tours, but China requires all foreigners to travel through Tibet with a guide, so I was stuck with him and his declarations of love until I left. Western women have a somewhat slutty reputation abroad and the men in some of the countries you visit may try to cash in on that. From one girl to another, lets try to turn our reputation around. Tiny shorts, tank tops, and dresses that are a little too revealing are not always appropriate apparel. The first way to getting less unwanted male attention is to cover up. The second is to lie. When I was single I found myself with an imaginary boyfriend who was always living in the place that I was on my way to. He was an English teacher, we were madly in love, and his name frequently changed to keep things interesting. This story was slightly more believable than when I said I had a boyfriend back home. I have met many girls who travel with a fake wedding ring, but guys who speak good enough English to hit on you have probably already seen that trick. Plus, if you are married and traveling alone, then they usually think something isn’t right in your marriage, giving them permission to continue flirting with you. My last bit of advice for the lone female traveler is to trust your instinct. Women have incredible gut instincts and the best way to stay out of trouble is to listen to them. If deep down you feel like something or someone is sketchy, then go someplace else. Taking a trip alone will change your perspective and your life. It’s one of the best things you can do for yourself. Don’t second guess yourself and go do it! You will thank yourself in the end, I promise!